I'm here at the fair (well, technically 11 miles away in the La Quinta Inn.) I had a great (albeit tiring) day at the fair! It's so great to meet everyone, and I got some great deals, got my books signed, and overall just had a blast forgetting about work and the everyday, and just immersed myself in the ponies! Ok, so here's a thread where everyone can post pics and little notes about the fair for those who did not get to go. Some good news! The current G3.5s (or whatever we're calling the current line) will soon give way to an awesome new line involving ponies from different generations (not sure about G2) and they are saying that this line will be geared towards older girls (yes!) and also that it will involve 40 characters (no more Bore 7!) AND it all begins with the TV show on The Hub in October. There is no plan to change the G3 pony pose that is used for the Fair, Comicon, and Art ponies, so we will still have that pose. There are no plans for more G1 vintage releases, as that was more for a special 25th Anniversary. There are, however, vintage Ts on 80stees.com that Hasbro license. 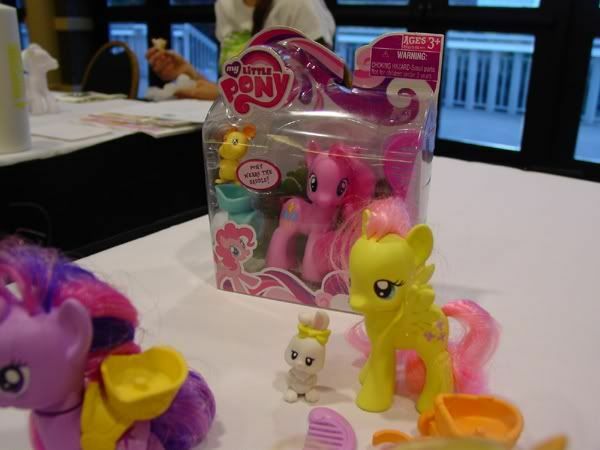 Dollymix ponies were brought up, and the US marketing team of Hasbro didn't know anything about them, but would look into it. Like I said before (but it bears repeating) Core 7 will end and the new line will take over (think the new Applejack and Pinkie pie). 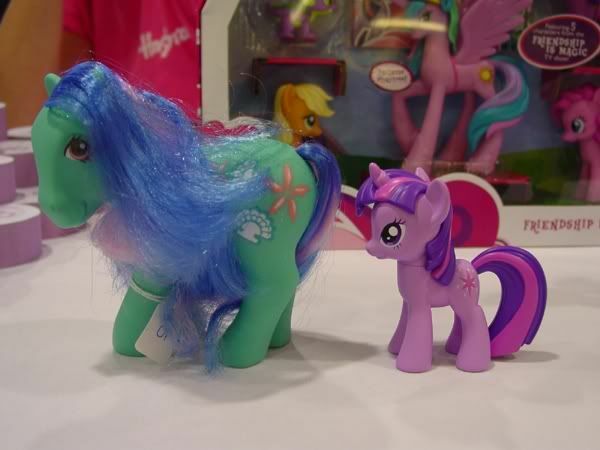 There will be new and different ponies, as well as old favorites... Hasbro apparently referrs to the rooted hair ponies of this size as the "OPP Assortment." There will be 40 characters released... no more same old 7! Ponywear, boys, and seaponies are not really going to be done ...at this time. I don't think they have any plans for it at all... but the mermaid ponyville are their answers to sea ponies, as little girls who they tested products on did not understand what sea ponies were. 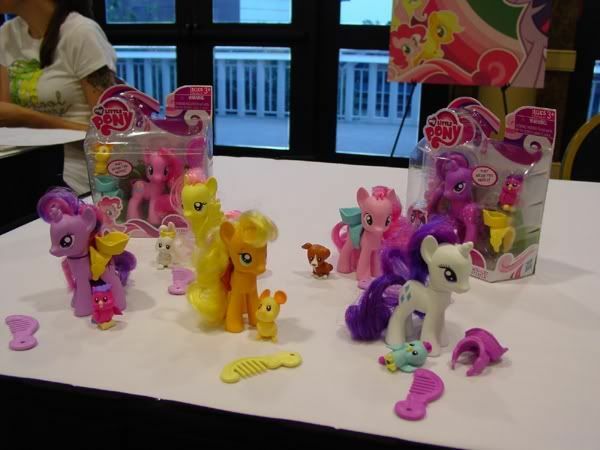 They may take a survey of collectors to see what color they will make the new blank pony... but it may be a while. There are not any more giant plushies in the works right now, as it was so expensive to make those. Also, no more charity ponies at this time... but if another anniversary comes up they will consider it. 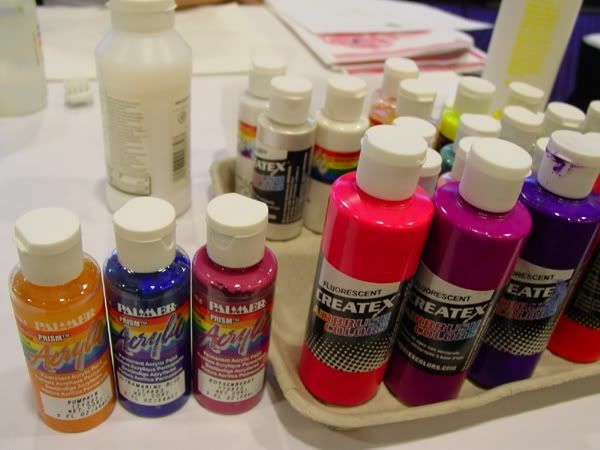 They asked for ideas on the new fair pony, and I suggested a sparkle, scented unicorn! The TV show will be on The Hub (an old Discovery Kids channel) and will begin in October. 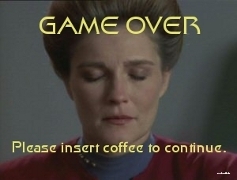 No plans for DVD yet. Better DV-R it! 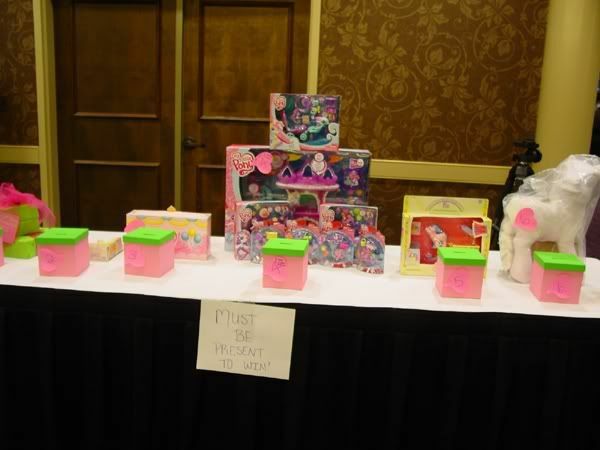 Promo ponies used for pamphlets and stuff are donated.... so it is conceivable collectors would get their hands on them at some points. And now to the pictures! I did a really bad job of getting pictures, sorry guys! I'm sure others got photos too. 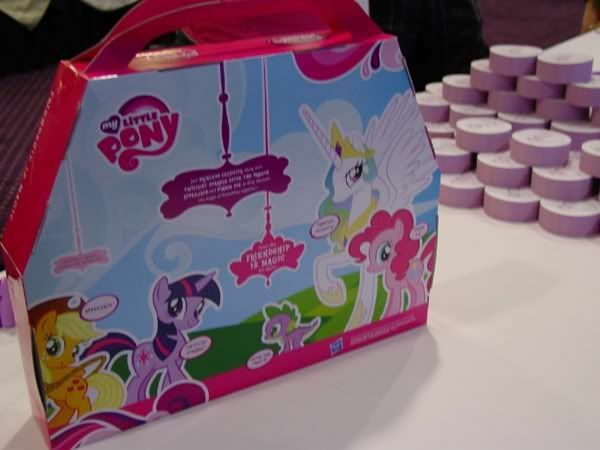 Hasbro did bring some product samples of the new toys from the cartoon series. In person, I have to say I like the molded hair better. They will be releasing both, I'm hoping someone got a picture they can post for us. These pictures were taken on my blackberry, so I'm sorry about the poor quality. I will try to remember to grab some pictures tomorrow, especially of the contest entries! 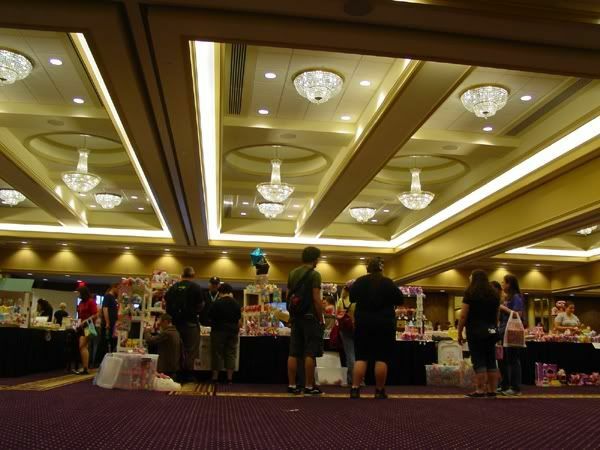 It was wonderful to meet everyone today, and if I didn't say hi today, please come by my booth tomorrow! I walk around so many times today. Lol. I was the one with the green stroller. I have some pictures but they aren't on my phone. 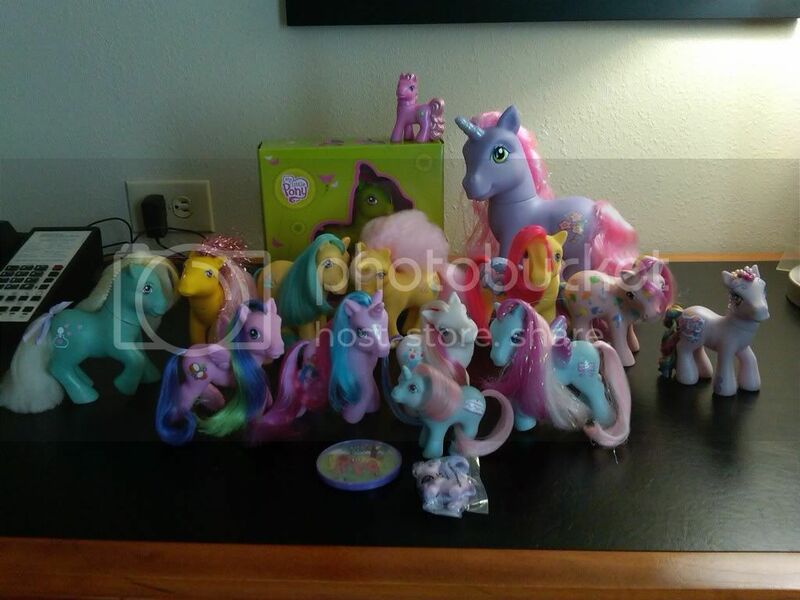 I got a few ponies I hope there will be some good price cuts I want one of the plushies so bad! 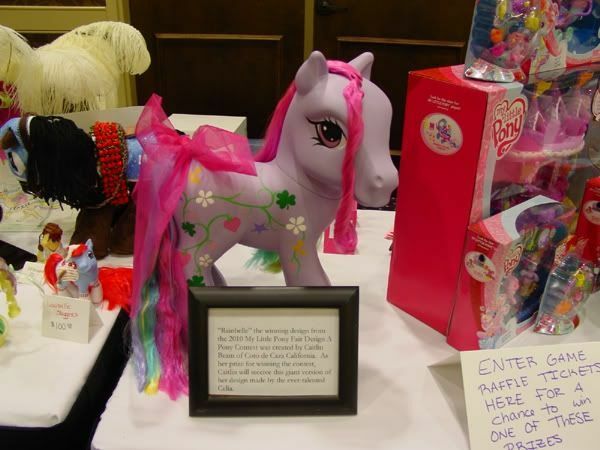 I entered two ponies in the contest and orange fairy pony and starbbys persona. We won the first round of bingo which was kinda exciting. I got deb to sign my pony book. But really haven't meet anyone. I'm one of the scarce fans of the G3.5s, but the G4s (Can we call them that now? >.>) I'm not sure how I feel about yet. Can anyone confirm or deny if they have flat or molded eyes? I'm both drooling and crying over the pony swag right now. Comic-con 2010 Here I come! 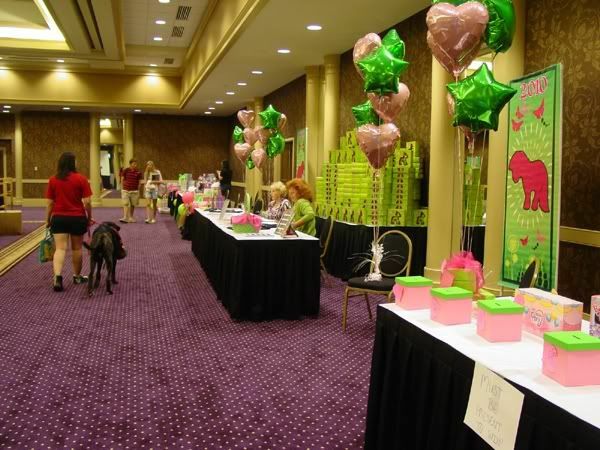 Is is to early to plan for the 2011 pony fair yet? thanks for posting the pictures they look amazing. I just have to ask what are those little round "hockey puck" looking things on the table? I'll check on the eyes for you. 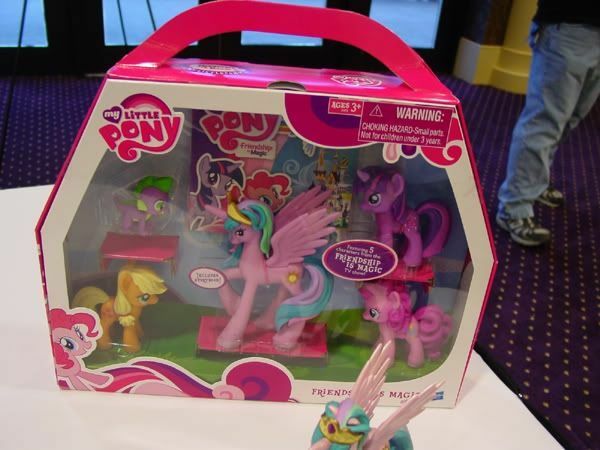 Hasbro actually said they weren't sure whether it was G3 or G4, and said that we pretty much dictated that. What do you all say? About the round things, those are pads of paper, like sticky notes. Forgot to say.... the new ponies will come with a little animal friend that will accompany them on adventures in the TV episodes. Also, any ideas that go through Hasbro usually take 2 years before they are on shelves. 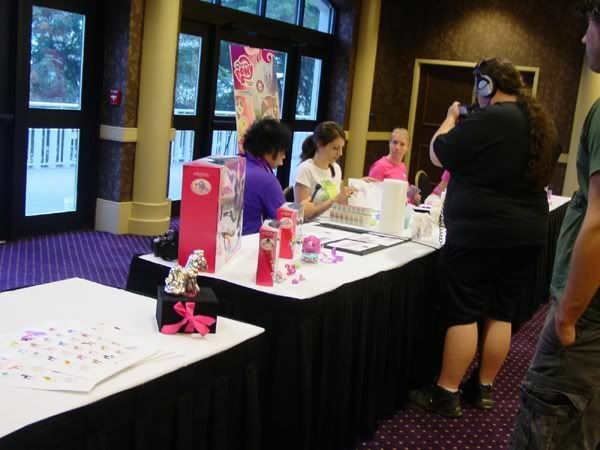 I just uploaded my MLP Fair pictures after day 1, so here is the link to my photo album! I'll probably upload more pictures after tomorrow (day 2)! I'm not a big fan of the new ponies - I like that they are bringing out new characters but the ears.... they are way out of proportion. I have pictures and am uploading them now but they are too big and will have to shrink them before I can post any. It would be great if you could find that out! *wags tail* Flat painted on eyes are a little bit of a pet peeve of mine, I like molded eyes. Whoever made those stained glass ponies is awesome!!!! 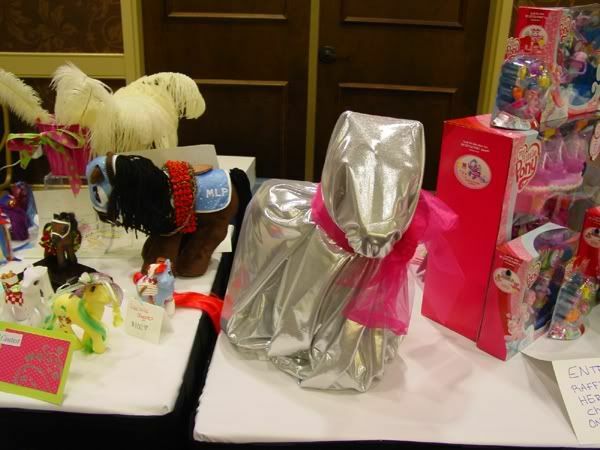 I am definitely making it to some pony functions next year! 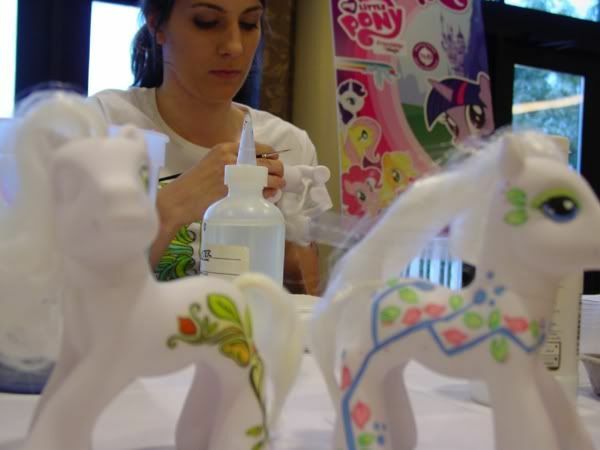 Those stained glass pony's are amazing. do i see a custom pony with a bucket of kfc on her back? 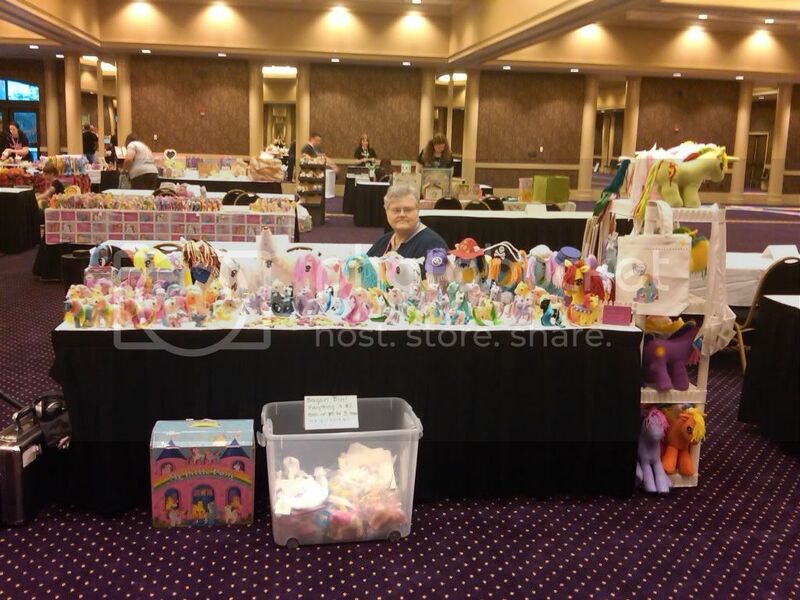 can someone tell me what all those big plushes were for? were they for sale? I think those big super huge ponies were sold in Australia? I didn't get up upload to many pics tonight but here's a link to my webshots gallery I'll have to upload what hubby took later. And yes, we played with the sea ponies all afternoon in the pool, lol. Click to see my deviantART gallery! Yes, someone was selling their giant plushies. With the new show possibly not being in ponyville and the new artist, I'm going to go ahead and write them down as G4 in my book. I'm also totally down for going back and declaring 3.5 as G4 and this bunch as G5. 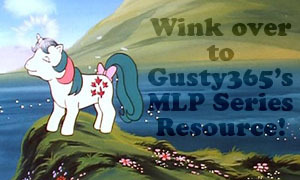 Oh did anyone ask why Rainbow Dash and Pinkie Pie sprout wings in the show? who made the stained glass ponies? i really want one! 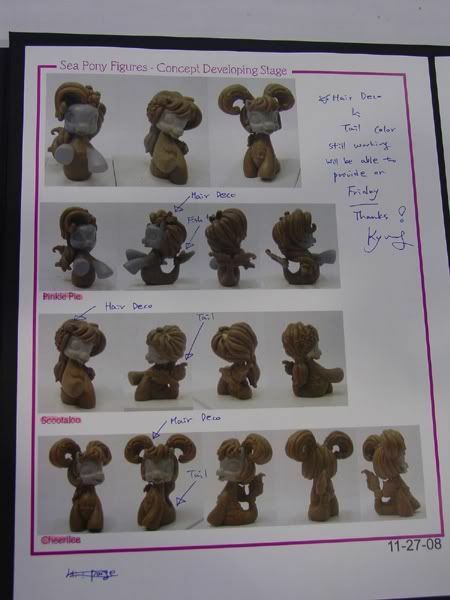 Nice to see there are going to be new different ponies and some older ponies coming back. Even though I don't care much for the look either. I will probably buy those. Didn't care for those core 7 releases. I did buy a few of the core 7's though. I consider them just g3, like g3 ponyville or g3 mermaid. Like g1 gem eye. Hey are those plushies the ones rowdy cowgirl's mom made?